There’s a buzz going around in soil science and health about our “microbiome”. Both are equally important for different reasons yet for the same result. Healthy soil teeming with microbes and bacteria, supporting a fungal network thus creating a vital microbiome grows nutritious foods. Nutritious foods, freshly picked or organically grown or purchased retains a bit of the soil biome and contributes to keeping our gut in better shape microbe wise. Researchers like the presenter above are connecting the dots about how our relationship to soil, microbes, and health are interconnected. It’s like another version of the web. And, It’s a win-win for us and the planet. My podcast guest this week, Kimberly Kresevic, founder of InSoil Health seeks to do just that. She can show farmers in real time the health status of their soil. Where there are deficiencies, she can advise farmers on the correct amendments to positively build soil health, all of which grows healthier foods. We take care of the soil and the soil takes care of us. A relationship we have forgotten about. We may not have had the science to understand our relationship in the past but now we do. And, It’s a bit scary when we look at the scope of the problems facing us today. 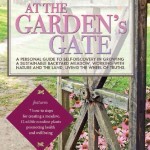 And, It’s fascinating, too and what folks are doing one talk, one garden, one business at a time. Yes, we can make a difference. If you can’t, join in a community garden venture. If you can’t, buy from a CSA. If you can’t, buy organic and from local organic farmers. Remember: every purchase is a vote. I hope you enjoyed the TED Talk above. He defines microbiome, shows colorful slides so we can envision how this microscopic system works within us. And, the best news is that with a few lifestyle changes, we can experience a more positive health response, enabling us to live healthy lives while improving our partnership with the earth. Did you enjoy his review? Let us know what you can do to make a positive change in your life today. Thanks. 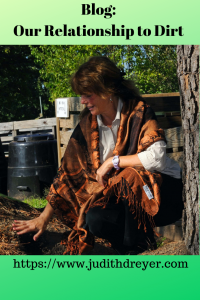 Judith Dreyer, MS, BSN, Writer, Speaker, and Workshop Presenter, Master Gardener. Description: Kim Kresevic, founder of InSoil Health returns this week to talk about the link between soil health and our gut health. We need to appreciate healthy soils once again; living, biologically diverse nutrient-rich soil. Why? The healthier the soil, the more nutritious food is produced and that translates into healthier food for us to consume which means more robust, vibrant health. Soil science on this level is relatively new, yet so vital to agriculture whether backyard farming or mega-farming. Microbes offer so much to soil integrity and microbes offer so much in our biology. Join Kimberly and me for another engaging discussion about soil and gut health. About My Guest: Kimberley Kresevic is President and Founder of InSoil Health, a data analytics and educational consultancy based out of Northeast Ohio. With diverse experience in both healthcare and biological cultivation, Kim brings a unique systems-based approach to current food production challenges. Driven by the principle that nutrition is the foundation of human health and vitality, Kim works with growers in all walks of life and at all scales to improve food quality using natural biological techniques. By focusing on soil population data, systems improvement, and the human health value proposition, Kim helps growers invigorate the Soil Foodweb, reduce input costs, and eliminate the toxic environmental effects of synthetic fertilizers, herbicides, and pesticides. It seems like nothing much is happening to the natural world around us. Winter has a couple of weeks yet to linger around. Though hostas peek through the snow, spring bulbs sprout a few leaves and tease us by popping up a little early, it’s still winter. This time and place on the wheel are traditionally thought to be a quieter time, a time for making garden plans, checking seed supplies, a time for dreaming of the blossoms to come. A tension builds though, before spring’s explosions of flower and beauty. Can you feel it? Though we have snow on the ground here in the NE, birds are more active, even tree buds are more obvious. My podcast guest this week, Dan Blanchard, Author, Teacher, Coach is passionate about growing positive relationships. He shared a couple of stories about how his honesty, though not popular in the moment, touched a student. Dan reaped the rewards years later. Working with our soil is about relationship too. Soon we will be digging in this dirt, itchy to plant seeds. What is your relationship to dirt? Sounds silly but to farmers and gardeners, the soil is the source of fertility on this planet. Do you take the soil for granted? 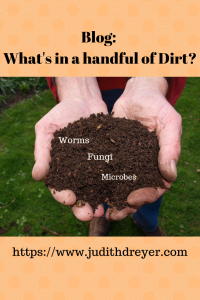 What does soil mean to you? Have you taken a walk lately, felt the cold bite your cheeks, felt the sun getting warmer, appreciated the clear blue skies? What about putting your awareness to the ground, where so much is taking place. Tension is building. It has to. It takes tremendous energy for a seed to break out of its shell and begin its journey of growth and potential. Like the teenagers that Dan works with, we have to wait and watch. Under the right conditions, we blossom and so does the earth. Getting back to our gardens: I highly recommend a soil sample of your garden beds before you plant. Contact your local agricultural extension office to obtain a kit and easy directions. The fees are usually nominal and the results worth it. Or use a lab like Logan Labs in Ohio for a more comprehensive analysis which I highly recommend. It cost a little more but if micro and macronutrients are not in proper ratios you could be wasting your time and money adding amendments that will not be able to be utilized. Also, take a separate sample for different areas. For example, collect one soil sample from your vegetable area, a separate sample for the ornamentals, And again, take a separate sample for flowers or for blueberries. Different types of plants have different needs. What’s your favorite Italian dish? Eggplant parmesan is one of my favorites, especially with a flavorful tomato sauce. It’s funny though that we think of Italian cuisine with tomatoes when they are thought to originate in the Americas. Settlers, not sure who brought this flavorful plant back to Europe in the 16th century. There are some plants still in the wild of Peru and Ecuador. Thomas Jefferson grew them but it took till the 1800s for tomatoes to find a place back here in the Americas. Today we grow hundreds of thousands of acres of tomatoes. Most of our tomatoes are cultivated and often have trouble resisting pests and diseases. 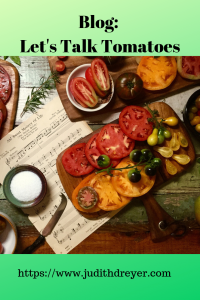 Tomato is a member of the nightshade family, which may be why early conquerors in central and south America thought it was poisonous as many nightshade plants are poisonous. 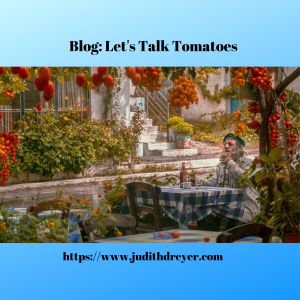 My podcast guest this week, Craig Floyd, manager at Coogan Farm in Mystic Ct., devoted his interview to growing healthy, vibrant tomato plants with high yield. How? Here’s a recap of his fabulous tips. Soil: A soil test is a must: tomatoes need four minerals in particular: Magnesium, Iron, Manganese, and Nitrogen. We recommend Logan Labs in Ohio who offer a more comprehensive analysis. Seed: Choose heirloom or organic seeds. Add an innoculant to your seed bag which can help germination time. When planting choose the biggest, fattest seed from the lot. Don’t plant too early. Do transplant when seedlings are 4″ high. Any taller they may not fulfill their potential. Plant 60″ apart. Place four basil plants around them or another companion plant like carrots. Drench seedlings with compost tea before transplanting. Then, water every day. Microbiology is so important. Add mulch material around plants every week. They need a good dose of worm castings, seaweed. Seaweed unlocks nutrients and keeps some bugs away. Craig keeps three main leaders and removes suckers. What is the tomato’s potential: try 22′ long yielding 300 lbs of fruit. That’s a wow in my book. When I visited Craig in his Giving Garden recently, he showed us his hoop house with poles high up to capture the growing vines. Can’t wait to visit in the spring and summer and watch their progress from seedling to fruit producing. The best part is that the food banks in New London reap the benefits. Healthy sustainable food is given to feed the food insecure: inspiring and motivating, I highly recommend you make the Coogan Farm and nearby nature trails a place to visit this summer. If you go, share a pic, tell us about your experience. We’d love to hear from you. Description: Craig manages the Coogan Farm part of the Denison Pequotsepos Nature Center in Mystic CT. He’s often at the Giving Garden, turning over the compost pile, checking on seeds, working with his volunteers creating 11,000 sq feet of edibles. Dedicated and passionate about feeding hungry children, he’s a wealth of knowledge. In today’s podcast, we talk about tomatoes, those red luscious fruits that are best eaten freshly picked on a hot summer’s day. Did you ever wonder what a single tomato’s plant potential is? Tune in for specific growing tips and how to’s for superb healthy tomato plants with high yield. About My guest: Craig Floyd. Farm Manager for the Coogan Farm in Mystic CT. Craig manages 11,000 sq feet as part of the Denison Pequotsepos Nature Center. He’s passionate about using his extensive farming experience creating a sustainable, healthy no-till,, no-spray garden in order to give quality food to the needy. He watches children with emotional and physical handicaps change as they roam the garden. It works for adults too. I encourage everyone to put the Coogan Farm and Nature Center Trails on their to-do list this year. It’s worth it. and if you have the time, why not lend a hand? Volunteers are always welcome. 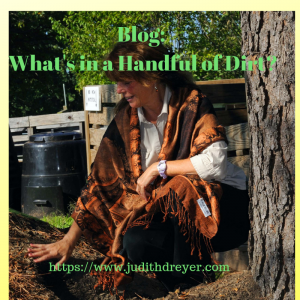 Blog: What’s in a Handful of Dirt? Dirt, soil, the very earth we stand on is capturing the heart and the mind of science. In today’s world, we have to acknowledge that we have not been good soil stewards. We have lost over one-third of the earth’s topsoil in just 100+ years. tillage farming, mono-crop farming was born from expansion after WWII. Today, family farms are almost an endangered species. 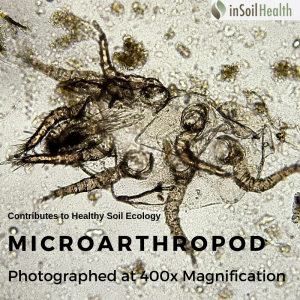 My podcast guest this week, Kimberly Kresevic, Founder of InSoil Health shares a microscopic photo of soil microbes. She brings her microscope out to farms and shows folks, in present time, what is in their soil. Are there enough microbes to indicate the soil is healthy and thriving? If not what can one do to amend that soil, cultivate and /or innoculate the soil to increase viability? Mycorrhizal fungi act like mediators within this vast underground world. They are traders too. This tree over here wants more of this nutrient, fungi find a supplier and in exchange they receive food. They love carbs and thrive on carbs from plants. Microbes: are also multifunctional: they help remove essential elements from rocks, keeping those minerals and more into play. They also help to break down organic matter. We know that various forms of decaying matter are rich with nutrients and the decaying process makes them bioavailable. It is said that one teaspoon of soil contains a million life forms. Pretty incredible and yet we have so much to learn. What can you do today to protect our soils? Look closely at your yard. Are there any more natural plantings you can include? Is so, make that a part of your action plan. For the beginner and novice gardener, consider leaving or cutting weeds down to the roots only. The root systems of these plants support and keep the mycorrhizal network alive and thriving. Fill in any bare spots. Make that a part of your spring cleanup. Plant an edible shrub if the spot is big enough. Use wildflowers. Add milkweed or other pollinator-friendly plants. Weeds, wildflowers need little to no attention, are drought resistant and build soil and sequester carbon. We got an electric mower to keep the paths in our garden manageable and at the same time keep the roots intact. We keep the clippings wherever they land. One new act we added last year is now part of our routine. What are your spring plans this year? What can you do to grow more viable, healthy soil? I appreciate all the comments. Please share. Thanks. Enjoy. Blog: Beauty and Magic of Pollinators. Earth Day: We make a difference with every choice we make. Judith Dreyer, MS, BSN, © all rights reserved.